Originally published under the title "Turkey: Erdogan's New Morality Police." 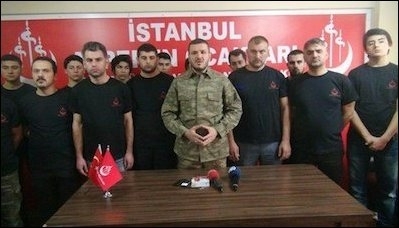 Alperen Hearths Istanbul chief Kursat Mican (center) warned Turkey's Jews last month, "We will prevent your freedom to worship here just like you are preventing ours [in Jerusalem]." Their number is just 17,000 in a population of 80 million (0.02%). They are full Turkish citizens. Most come from families living for centuries in what today is modern Turkey. They pay their taxes to the Turkish government. Their sons are conscripts in the Turkish army. Their mother tongue is Turkish. When someone asks them where they are from they say they are Turkish -- because they are Turkish. Nevertheless, the Turks think of them as "Israelis" -- not because they are not Turkish, but because they are Turkish Jews. The members of Alperen Hearths -- a bizarre name for a youth group -- are also Turkish. They speak the same language as Turkish Jews and they carry the same passport that proudly sports the Crescent and Star. The members of this group, however, think that they are Turks but that Turkish Jews are not. The Alperen group fuses pan-Turkic racism with Islamism, neo-Ottomanism, anti-Western and anti-Semitic ideas. It promotes an alliance spanning Central Asia to the Middle East based on "common historic [read: Turkish] values." The Alperen Hearths fuse pan-Turkic racism with Islamism, neo-Ottomanism, and anti-Semitism. In April, the Alperen group announced that it would support highly controversial constitutional amendments granting President Recep Tayyip Erdogan new sweeping powers narrowly accepted, with 51.4% of the national vote, in a referendum. They are, in a way, Erdogan's willing army of young Ottoman soldiers. Degenerates will not be allowed to carry out their fantasies on this land...We're not responsible for what will happen after this point ... We do not want people to walk around half-naked with alcohol bottles in their hands in this sacred city watered by the blood of our ancestors. The Istanbul governor's office later banned the march. Members of the ultranationalist Alperen Hearts protest Christmas celebrations in Turkey last December by holding a man dressed as Santa Claus at gunpoint. The Alperen can also sometimes be generously amusing. 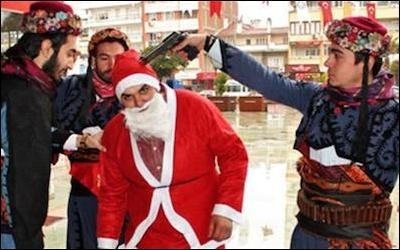 In December 2016, a group of Alperen youths celebrated Christmas and New Year's Eve in Turkey by holding a man dressed as Santa Claus at gunpoint. Burak Yasar, a provincial head of the group, said: "Our purpose is for people to go back to their roots. We are Muslim Turks and have been banner-bearers of Islam for a thousand years." The Alperen were at the heart of a new anti-Semitic Turkish show recently, apparently inspired by Erdogan. This time, Erdogan's incitement against Israel themed around the Jewish state's control of security at the entrances to the Temple Mount site in Jerusalem. The Turkish president warned that Israel could not "expect the Islamic world to remain unresponsive after the humiliation Muslims suffered with the restrictions at the Noble Sanctuary" -- a reference to the new security measures briefly instituted by Israeli officials at the entrances to the Temple Mount, which were removed after a few days. Muslims may worship at the al-Aqsa mosque, but there should be safety precautions to protect both them and the mosque. It was the Muslims, not the Jews, who were telling Muslims not to enter the Temple Mount. Kursat Mican speaks to reporters (left) at a protest outside Istanbul's Neve Shalom Synagogue (right) last month. The Alperen, however, were immediately with Erdogan. They protested outside one of the most significant synagogues in Istanbul, to denounce Israel's security measures following a deadly attack at the Temple Mount that left two Israeli police officers dead. "If you prevent our freedom of worship there [at Jerusalem's al-Aqsa Mosque] then we will prevent your freedom of worship here [at Istanbul's Neve Shalom Synagogue]," a statement from the Alperen said. "Our [Palestinian] brothers cannot pray there. Putting metal detectors harasses our brothers." Some Alperen youths kicked the synagogue's doors and others threw stones at the building. 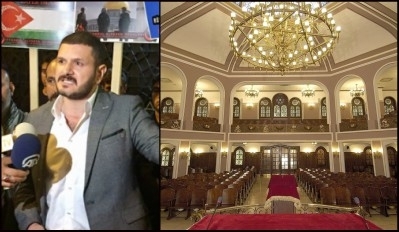 Eren Keskin, a human rights lawyer and activist, said that none of the Alperen members has been prosecuted for preventing prayers at the synagogue or for acts of violence in front of it. "This [group] is evidently being protected by the government ... It must be viewed as a violent group... What they do is to frighten the whole Jewish community." It may sound absurd that a violent bunch of young Turkish men attacked a prayer house attended by other Turkish men and women in order to protest security measures announced in a foreign country. There were no protests in front of Israel's diplomatic mission buildings in Turkey. The protest was directed at full Turkish citizens just because these full Turkish citizens belong to a faith other than the majority's. To paraphrase George Orwell, "Some Turks are more equal than others." Just as with the Egypt's Copts -- the indigenous descendants of the pharaohs; or the Yazidis in Iraq; or the Armenians, Greeks and Kurds in Turkey, the Jews are Turkey's "foreign" Turks, outcasts in the land where they and their ancestors wore born.